My grandmother often told me,"If you don't see what you what, create it yourself." I started cooking in my grandmother's restaurant as a kid, and inherited her respect for seasonal foods and her commitment to two central ideas: keep it simple and keep it fresh. Cooking is the joyous part of the industry, but the hours, nights, weekends, and holidays that I had to work in food service left me searching for a way to cook for a living on my own terms. I earned a college degree and worked in the corporate world while continuing to cook professionally. I was employed as a marketing vice president during the week and cooked in a French restaurant on weekends. I had the benefit of a broad range of experiences before I decided to blend the two disciplines. Finally, I decided to open a business cooking for time-pressed clients who wanted to dine out-at home. My sense was that busy people would welcome the opportunity to have custom-designed, palate-specific meals that were prepared in their own kitchens and stored for their future enjoyment. I developed a business where I was paid to do what I love: shop and cook. 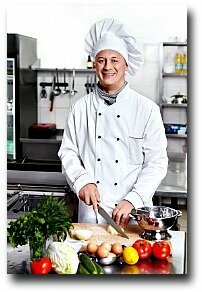 I have been a working personal chef for more than twelve years and have been teaching, training, and mentoring others who want to own and operate their own successful businesses for more than ten years through the American Personal Chef Institute(APCI) and the American Personal Chef Association(APCA),which I founded to support and memtor the individuals trained through the institute. So far, the APCI and APCA have trained, assisted, and supported more than five thousand individuals. My staff and I have helped set up and operate innumerable successful personal-chef businesses. We make certain each personal chef is clear about what level of service they intend to offer, and to whom, and then advise them on how to find their roster of clients. We show personal chefs how to plan menus that not only include a full range of tastes and textures, but also efficient shopping and cooking times in order to reach profitability quickly. Many of our members are self-taught passionate home cooks, while others are professional chefs. What you need to remember about this industry is that no two personal chef businesses should look alike, and no two clients are the same. A personal chef must find clients whose food tastes match with the chef's skills, whether this means cooking comfort food, a regimented diet for a diabetic, or highly sophisticated food for an epicure.